When it comes to ultra mobile computing, graphics matters. That's why Apple stuck with the same two ARM CPU cores for the third-gen iPad but went with a doubling up of graphics performance. But it wasn't graphics from ARM. While ARM mobile CPU designs like the Cortex A9 and Cortex A15 dominate smartphones and tablets, the ARM Mali graphics core hasn't been nearly so successful. But hang on. Why does graphics matter so much for smartphones and tablets? Isn't the big news all about how many CPUs cores you have? Actually, no. Much of what makes a smartphone or tablet feel snappy isn't so much the underlying app load on the CPU as things like smooth rendering, flicker-free animations and transitions. The one obvious exception to that is games, which cook up a massive computation load across the board. And it just so happens that all the above, including games, is exactly what graphics cores are good at. Strictly speaking, you could do all that on the CPU cores. But CPUs are general purpose beasts – jack of all trades, master of none. Dedicated, custom hardware, otherwise known as fixed-function hardware, is almost always both more powerful at getting a given job done and more efficient. That's win-win, especially in a mobile environment where power efficiency is so very critical. The other key trend that feeds into all this is rapidly increasing screen resolutions. All of that graphics stuff only becomes harder when resolutions go up. iPad 3 has four times the pixels of iPads 1 and 2 thanks its 2,047 x 1,536 native resolution. That's three million pixels. Even mainstream tablets are likely to settle on 1,920 x 1,080 pixels, or roughly two megapixels. Meanwhile 720p or 1,280 x 720 pixels is becoming routine for high end smartphones. That's a million pixels to drive. Factor in typical refresh rates of 60Hz and that means pumping 60 million pixels every single second. In a smartphone. Terrifying. So now you know why graphics matters, what's the ARM Mali core like? Currently, the fastest version of the Mali graphics core you'll find in smartphones and tablets is the Mali-400 MP. 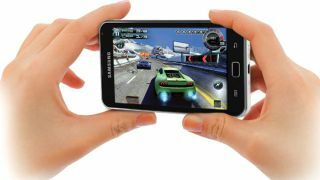 It's in both the Samsung Galaxy S2 and the Samsung Galaxy S3, for example. The first thing to note is that it's not a separate chip. Like pretty much all graphics cores in phones and tablets, it's integrated into the main SoC chip that also includes the CPU cores and several other functions. Like CPUs, mobile graphics tends to be measured in "cores". Thus the Mali 400 comes in one to four-core configurations. However, the concept of cores in the world of graphics is much more amorphous than CPUs and should really only be used to compare configurations of the same graphics architecture. Anyway, the ARM Mali-400 MP is a very nice little graphics core and is right up there with the best mobile graphics cores including that of NVIDIA's Tegra 3 chip. The one exception is the Imagination Technologies PowerVR SGX 543MP4, as found in the Apple iPad 3. It's still by far the fastest graphics found in any ultra mobile ARM-based SoC. That could change with the release of ARM's next major Mali graphics architecture, known as Midgard and to be branded the ARM Mali-T600 range. The big news here is the introduction of a unified shader architecture. That's something that's been standard in PC graphics cores for nearly five years. Generally speaking, having unified shaders rather than discrete vertex and pixel shaders makes for a more balanced and efficient graphics core. The first example of Midgard, the ARM Mali-T604, also has two ALU pipes per core to the Mali-400 MP's one. So it's more powerful as well as better balanced. The ARM Mali-T604 is due to appear later this year in the Samsung Exynos 5 dual-core SoC. Again the ARM Mali-T604 graphics itself is available in configurations from one to four cores. Samsung says the Exynos 5 will have twice the graphics power of the Mali-400 powered Exynos 4. You can expect to see the Exynos 5 appear in upcoming Samsung Galaxy smartphones. However, where things get really exciting is the ARM Mali-T658. For starters, it's claimed to be up to 10 times faster than the Mali-400. But it's also said to be optimised not only for graphics but also highly parallelised computing. Exactly what impact that might have on smartphone and tablet performance or applications is hard to predict. General purpose computing on PC graphics chips has yet to deliver on copious hype. Still, what we do know is that Mali-T658 will achieve its massive performance by offering up to eight graphics cores, each core with double the arithmetic pipelines of the Mali-T604 design. It's an absolute beast in other words. Of course, the competition won't be standing still in the meantime. Everyone from Apple-favourite Imagination Technologies and NVIDIA to Qualcomm is working on more powerful graphics for smartphones and tablets. It's all happening so fast, it may not be long before smartphones and tablets offer the most interesting – and maybe even the most powerful – graphics technology, not PCs or games consoles. Now there's a thought.